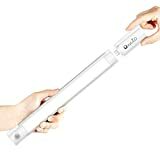 The OxyLED USB Rechargeable Motion Sensor LED Lights are insanely popular for a few important reasons. First, they work very well and turn on instantly if there’s motion anywhere in the area. Second, they’re easy to stick anywhere because they don’t need to be plugged in. Third, they’re easier than comparable products to recharge because they come with their own detachable battery! They’re awesome, and they’re on sale today on Amazon for just $13.